If you look at the DIY scene, you will see chip amps everywhere. No wonder, they are easy to build, and offer a lot of good sound for the money. But strangely, as it was a commercial chip amp, the Gaincard, that started people thinking of chip amps as serious hi-fi, there haven't been that many commercial versions. If you are one of the few who don't know what a chip amp actually is, or haven't seen the famous Gaincard 47, let me enlighten you. A chip amp is so called because the majority of the amplification circuit is contained on a (silicon) chip. With the addition of a comparatively few extra resistors and capacitors, a power supply, and a case with some suitable sockets, that's it. The original idea was to facilitate the construction of cheap amplifiers destined for duty in cheaper equipment such as stack systems. Then one designer realised the potential advantage of keeping so much of the circuit in a very small space, and wondered just how good he could make an amplifier using one of those chips. Junji Kimura was the name of the designer, and his creation, the Gaincard became something of a legend. Geoff Husband reviewed the Gaincard for TNT back in in 2000, and you can read that review here. The only problem with the Gaincard, at least for those of us on a budget, was the cost - 3300 US dollars for the amplifier and matching power supply! So it wasn't long before the DIYers had worked out what was inside, and circuit diagrams began to spring up on the various forums. Building copies of the Gaincard, or Gaincloning as it became known became very popular, and it's fair to say that it gave many an audiophile on a low budget, the chance to hear something better than they could otherwise afford. I know from mail to my Decibel Dungeon web site that Gaincloning got many a novice started with hi-fi DIY. There was a caveat though! These lower powered amplifiers didn't like a difficult load, and were much happier driving a more efficient, easy to drive loudspeaker. But with the right partner, they could, and still can, surprise many who have never heard one. Somebody who bought an original 47 Labs Gaincard liked it a lot, and so did his audiophile father. But the latter wasn't prepared to pay out the asking price, so the son, Funjoe, having failed to locate a second-hand example, set out to build one. By this time Gainclone design had evolved well away from the original design of the Gaincard, but Funjoe wanted to replicate the original sound as closely as he could, so he experimented with his design until he did so. One thing led to another, and Funjoe found himself building a commercial version of his amplifier, and Clones Audio was born. And all that brings us to the subject of this review, the Clones Audio 25i integrated amplifier. The 25 refers to the power output, ie 25 watts per channel (WPC). Clones Audio offer a more powerful version (the 50i) that will drive less efficient speakers. The power output of a chip amp depends on the chip used, and on the power supply rating. And it's not just the power rating that is changed, the sound quality changes too. 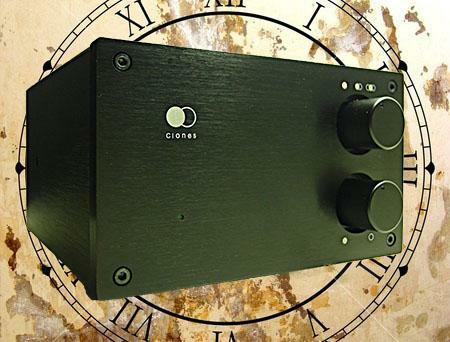 Clones Audio also offer various versions of their amplifiers, eg integrated, or power amplifier. They also offer a matching preamp, and a standalone power supply unit. But it is the 25i that was supplied for review. The Clones Audio 25i is exceptionally well made with a very solid case constructed using thick aluminium. The case is divided into two compartments, one for the power supply consisting of the mains transformer and rectifier circuit, and the other, smaller section housing the amplification circuit. The thick aluminium divider also doubles up as a heatsink. In fact, as it is connected to the rest of the case, the whole construction acts as a large, non-resonant heatsink. Internally, the neatness and quality of the build echoes that of the exterior. Styling is conservative but the proportions of the case, the satin black finish, and the matching knobs set to one side of the front panel, give the 25i a very classy appearance. 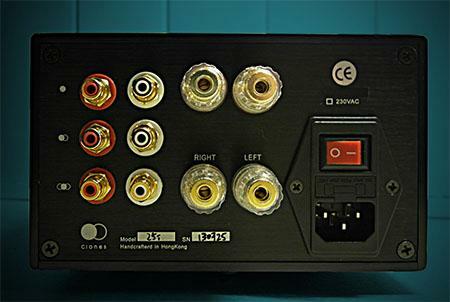 The quality of the sockets on the rear of the case is high, and the whole impression, particularly when handling this amplifier, is one of high quality. The 25i boasts three inputs that are selected via a rotary control knob on the front of the amplifier. A matching knob adjusts the volume level. Both controls have a reassuringly solid feel. In my second system, I had been using my own Gainclone for some months. 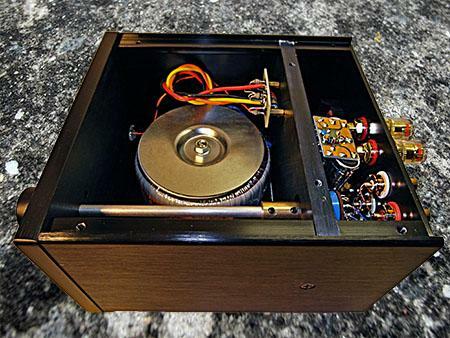 It was connected to my modified MS Pageant II speakers, rated at around 89/W, I found that they have always worked very well with the many chip amps that I have built or reviewed, even the 12 volt versions. The rest of the system consisted of a computer fed Miniwatt n4 USB DAC. Volume control was via the computer and I left the 25i's volume control at maximum (apart from testing it to make sure that it was quiet, as it was). When powered up but not playing music, the 25i is totally quiet. The review sample was obviously well burned in because right from the start I could detect the quality of the sound that it produced. A little bit different from my own Gainclone that I presume would be more akin to the 50i (as it uses the larger power supply), but it would be impossible to state that one was better or worse than the other. The lower powered chip amps tend to sound slightly more laid back. They are beguiling in their presentation, offering a quality that it is very difficult to describe. But that's what I'll try and do now. The presentation of the 25i was very even handed. I didn't feel that the top end was 'too much' or that the bass was lacking very much. You won't get thundering bass out of one of these amps but what there is, is first rate, an certainly not insubstantial. It is taught and tuneful, and very well integrated into the rest of the music. The midrange is best described as 'luxurious' with everything, including vocals being crystal clear. The imaging was precise, the sound stage wide and deep, and the timing was spot on. Listening to the 25i it was hard to find anything very negative to say about it. It doesn't have quite the sparkly top end that I have heard with some other amplifiers but then again, it was also 'kind' with some poorer recordings, and not fatiguing to listen to for long sessions. Within its favoured "envelope" The Lab 47 Gaincard is the nearest thing to the "length of wire with gain" ideal that I've ever heard. That's what have I've found with a well designed chip amp, of which the 25i is a good example. As a bonus, the 25i provides that amount of transparency without being intolerant of poor recordings. In all the 25i makes for a very enjoyable listening experience, and gives a real insight into each recording. PRaT was excellent with the bass lines 'hopping' along, and the Q-Sound test with 'Amused to Death' by Roger Walters was passed with honours. Having listened to the 25i for many hours before comparing it with my own version, I thought that I slightly preferred the presentation with the more powerful amplifier. Then I went back to my own GC and wasn't so sure. I nearly said that each amplifier had its own strengths and weaknesses but there were no negatives. It is simply a question of each amplifier, with its different power supply sounding slightly more suited to different types of music. With quieter music, the lower powered 25i had more delicacy, while my higher powered version offered slightly more involvement with live music, particularly rock. I guess what I am saying is that if you are considering buying one of the Clones Audio amplifiers, you will need to think very carefully about which version you buy. If the 50i is of the same very high quality as the 25i (and I have no reason to believe that it isn't), I would heartily recommend either amplifier depending on which speakers that you pair them with, and perhaps which type of music you listen to most. Your speakers will be another factor in choosing the optimum chip amp but amp/speaker matching is important for just about any amplifier. I wanted to try a stage between the USB DAC and the 25i so I chose the iFi iTube. That brought about a subtle improvement in the lower frequencies, with the percussion in particular becoming more tangible and realistic, more 'in the room'. This was in common with other amplifiers that I used the iTube with, and I thought it a worthwhile addition to the 25i. The 25i works very well without a previous buffer or preamp but the iTube with its 'box of tricks' did add something extra to the presentation, and overall enjoyment of the music. "But", I hear you saying looking at the price, "If I want a simple amplifier, I could buy one of those class D or T amps for much less than that!" It is true that one of the class D or T amps can look much more attractive to somebody on a very low budget. At the price, the Clones Audio chip amps certainly aren't 'bargain basement' stuff. Of course it is easy to get some chips, add some components, and have a working chip amp. Where the majority of the cost goes is in the casework, and that can vary a lot depending on the quality. The 25i comes in a very solid case, constructed of what looks like machined aluminium. It's built like a tank, and designed to last a very long time. I find its understated design quite attractive, and reiterate that the quality of components and sockets is very good too. But price aside, I'm going to be totally honest here, and say that there is something about the chip amp sound that I prefer over just about every class D and T amp that I've heard. Beguiling is the word I used earlier, and that for me sums up the sound of a good chip amp very well. The scarcity of components in a chip amp makes for a clarity that not many other types of amplifier can match (one reason that I find them ideal for reviewing purposes). Where the price of the 25i and its siblings may be a decider is when comparing them to discrete integrated class AB amplifiers, or even some tube amplifiers. But if you like the chip amp sound, can't afford a Gaincard, and don't want to, or can't, build something for yourself, the 25i/50i will provide honestly good amplification. And remember, the original motivation for building the 25i was to produce a less expensive option to the original 47Labs Gaincard. I've never heard the Gaincard, so can't offer an opinion on how close the two sound, but given that the designer of the 25i has heard the Gaincard, and voiced his creation to be as close as possible, I will assume that the 25i is close enough to the Gaincard to warrant close comparison. The 25i isn't a budget amplifier, it sounds better than that, and for that reason I'm going to give the 25i my recommendation. Just make sure that the speakers that you will partner it with are 'chip amp friendly', and that you choose wisely between the 25i, and the more powerful 50i. It's much a question of do you like your music laid back, or do you like it more 'live' and up front. And if you can't afford a Clones Audio amplifier, but you can handle a soldering iron, there's little to stop you building your own. There's probably no better documented design in the history of DIY amplifiers, both on Decibel Dungeon, other chip amp sites, and the hi-fi forums. But be warned - Gaincloning is addictive and I've probably spent as much on it as the price of the 25i! Clones Audio have now informed me that the 50i (and 50p) will no longer be available as most of their customers prefer the 25i. However, they are starting work on the design of another 50 WPC amplifier to be announced soon.